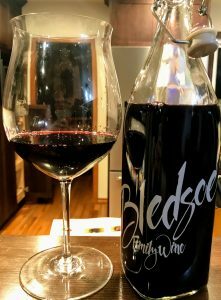 A few quick thoughts on the 2015 Bledsoe Family Red Blend from Walla Walla. Bledsoe Family Wines is the second label of former NFL quarterback Drew Bledsoe, owner of Doubleback. A Walla Walla native, Bledsoe started his winery in 2008 with Chris Figgins of Leonetti as winemaker. In 2015, Josh McDaniels succeeded Figgins as winemaker & general manager after working closely together for several vintages at FIGGINS, Doubleback, TOIL and Leonetti. Bledsoe sources fruit for the red blend primarily from vineyards in the SeVein project in the Rocks District of Walla Walla. This includes two estate vineyards, McQueen and Bob Healy (named after Bledsoe’s father-in-law) as well as Seven Hills Vineyard and the XL Vineyard owned by John & Martina Rempel. Other wineries that use fruit from XL includes Rasa Vineyard (owned by Master of Wine Billo Naravane), Sweet Valley Wine (Josh McDaniels’ winery), Dusted Valley, Reininger, Bridge Press Cellars, El Corazon and Five Star Cellars. The 2015 vintage is a blend of 65% Cabernet Sauvignon, 20% Petit Verdot and 15% Merlot. McDaniels aged the wine for 16 months in a combination of 50% new and 50% used French oak barrels with 1,017 cases produced. The jammy black fruit notes of this wine remind me more of Napa than Washington. Medium intensity nose. Dark fruits–black plums and black cherries. A little dark chocolate espresso as well. On the palate, the dark fruits carry through and feel very weighty and full-bodied. Medium acidity gives some balance but not quite enough to keep the fruit from being jammy. The medium-plus tannins are ripe with a velvety texture that is accentuated by creamy vanilla from the oak. Moderate length finish ends with the rich fruit. In a blind tasting, I would peg this as a Napa Cab with a fair amount of Merlot blended in. The body, mouthfeel and rich dark fruit are very hedonistic like Napa. While not typical of what I associate with Washington, at $45-55 this drinks on par with Napa Cabs at twice the price. Tagged Billo Naravane, Bledsoe Family, Bob Healy, Bridge Press Cellars, Cabernet Sauvignon, Chris Figgins, Doubleback, Drew Bledsoe, Dusted Valley, El Corazon, Figgins, Five Star Cellars, John & Martina Rempel, Josh McDaniels, Leonetti, McQueen Vineyard, Merlot, Petit Verdot, Rasa Vineyards, Reininger, SeVein, Seven Hills Vineyard, Sweet Valley Wine, The Rocks District, Toil, Walla Walla, XL Vineyard.